1. If you are a beginner, don’t start with a large knitting project like a sweater or a cardigan. Instead try to knit a headband or a simple scarf – something that you can finish quickly. 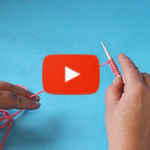 Focus on making neat stitches and achieving a nice shape. 2. Needles come in various sizes and on the yarn label you can see what needle size you should use with this particular yarn. However, if you don’t have the yarn label or if you are not sure exactly what size to pick, a good rule of thumb is to use needles twice as thick as your yarn. 3. After casting the stitches onto the needle, knit a row of purl stitches so that you can start your main work with a row of knit stitches. It is recommended to start this way, unless the knitting patterns requires you to start with a different stitch. 4. Beginners sometimes get confused how to continue if they have left their work in the middle of the row. When you are not sure what to do, take a look at the yarn coming from the ball. If the yarn is on the right-hand needle, then you have to knit the stitches from the left-hand needle. 5. When using the knit stitch oftentimes every other row turns out a little looser than the previous. If that is the case, you can use a smaller needle to knit the looser rows until you get used to working rows of equal tightness with two needles of the same size. 6. 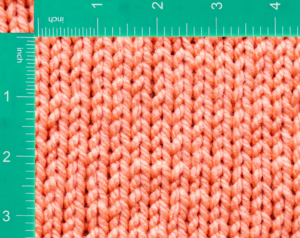 If you are a beginner it is recommended to knit a small sample of the actual knit work first in order to see if the pattern will turn out right and if the needles are the right size. Cast on 15-20 stitches and knit several rows to see how it looks. This way if you have to undo your work later, it won’t be so frustrating. 7. When washing hand-knit clothes or accessories use detergents specifically meant for this type of items and check the yarn label to see whether it should be hand or machine washed. Always follow the instruction how to clean and care for your hand-knit items, otherwise you could ruin them for good. 8. Dry hand-knit items by spreading them on a dry towel over a flat surface. Arrange the item into its original shape by patting it; don’t tug and pull. Leave it to dry for 24 hours and if it is still wet, change the towel with a new dry one and leave it for another 24 hours. 9. Ironing items made entirely of wool should be done by placing a wet towel over them without touching the iron to the wool. Yarn labels usually provide information about the proper way of washing and ironing.